A NATURAL dog food being made in the the United States. OUR PHILOSOPHY - Mother Nature is the ultimate chef for dogs in the wild, providing all the nutritional needs from only a few food sources. We have modeled our product-line after the culinary excellence found in nature. Fresh meat - it's the difference that makes Nature's Kitchen a product others strive to match. Since dogs are carnivores, a minimum of 80% fresh meat is used in all of our products. The result is the most nutritionally complete dog food ever made without the use of any preservatives. Packaged in our 1lb (100%) recyclable containers, Nature's Kitchen is made with only human-grade ingredients and has the highest meat content available in a wet or dry pet food. Our proprietary low-temperature process gives Nature's Kitchen a unique texture and flavor, while preserving many of the essential proteins and enzymes critical for digestion. Flash freezing provides the most efficient and natural way of preserving the integrity of the food, without using anything artificial to maintain extended shelf lives. While we are not considered a truly organic dog food, you will find that Nature's Kitchen is as close to what nature intended "as nature intended". Owners who demand the best nutrition for their dogs insist on feeding them Nature's Kitchen Dog Food! WHO WE ARE - Founded by two lifelong dog lovers in 2011 with a combined 20 years in the pet food industry, Maverick Pet Foods was born in an effort to create the highest-quality dog food available. We began creating a recipe that aligned with our fresh meat philosophy. After feeding this recipe to our own dogs and seeing dramatic improvements in their health, we introduced our first brand, Nature's Kitchen Dog Food in early 2011. As a unique entry to the canine nutrition market, Nature's Kitchen features over 80% fresh meat. We delicately cook at a low-temperature allowing the meats to simmer in their own juices. We freeze our product for freshness eliminating the need for any preservatives. Since dogs are strict carnivores, they require fresh meat. Nature's Kitchen is designed to provide your dog complete nutrition using fresh meat, wholesome veggies, salmon and olive oils, and a full range of natural vitamins and minerals. Nature's Kitchen, the food your dog craves and the healthiest way to give them the fresh foods they deserve! Nature's Kitchen is the Raw Diet Alternative providing the high fresh meat content of Raw, with the convenience and safety of cooked foods. Maverick Pet Foods believes that dogs are carnivores and have a common ancestor...wolves. Basing all of our products on how prey exists in nature, we have created the most nutritionally balanced foods. Maverick Pet Foods will soon introduce the revolutionary NEW product, Nature's Kitchen Canine Morsels (Available Summer 2013). Genesis RAW, provides dogs the most natural nutrition available. Our blends are made up of 84% meats combined with vegetables and natural vitamins and minerals. Genesis RAW is the complete food. 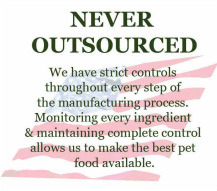 Our goal is to produce All-American dog foods: American ingredients, American craftsmanship & American ingenuity, creating products of unrivaled quality. Truly All-American dog foods, Nature's Kitchen and Genesis RAW. With traditional dry food (Kibble), each individual morsel is covered in a layer of starch. It has to be broken down in the stomach before digestion can begin. Since this takes time, the food stays in the stomach for longer, the dog has a "food belly" and there is an ongoing risk of torsion problems (i.e., torsion of the stomach). 1.Nature's Kitchen Dog Food will not swell in the stomach will not cause bloating. 2. A shiny coat: The nourishing, cold-pressed oils contained in the food and the purity of our ingredients provides sufficient omega 3 and 6 necessary for beautiful coat. 2. The food is digested quickly. 3. The intestine quickly absorbs the nutrients. 4. Carbohydrates and proteins are metabolised perfectly. 5. • Less "output (stool)": As Nature's Kitchen Natural Dog Food will be made optimal to the body, the dog has neither gas nor diarrhea. Even the "little presents" they leave behind are very small and firm. 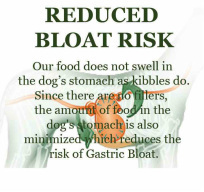 • No Bloat: Nature's Kitchen Dog Food will not swell in the stomach and cause bloating. • The ease of digestion: The liver, kidneys and skin are not put under strain by ingredients that are of no benefit often found in conventional dry food (kibble). • Greater muscle mass: The high-quality proteins from the fresh meat immediately stimulate muscle building. • A shiny coat: The nourishing, cold-pressed oils contained in the food and the purity of our ingredients provides sufficient omega 3 and 6 necessary for beautiful coat. • No intolerances or allergies: Nature's KitchenDog Food will be digested so easily because of its natural, healthy composition that intolerance is extremely rare. The metabolism is not put under strain by denatured ingredients that can cause inexplicable itching or other skin problems. • Less "output (stool)": As Nature's Kitchen Natural Dog Food will be made optimal to the body, the dog has neither gas nor diarrhea. Even the "little presents" they leave behind are very small and firm. Dog food allergies and sensitivities have become a common problem for dogs these days. Other health issues such as fleas, mange or external allergens including pollen and dust can cause skin problems. It is always better to check with your veterinarian to make sure these are not the causes of allergies. It is common that dog food allergy is not suspected at first because the dog has been eaten the same dry dog food for years with not reaction. However just like humans, dogs can develop allergic reactions to particular substance (food, ingredients, chemicals, preservatives, etc) if fed regularly for a long period of time. In other words, food allergies can appear in any breed, both males and females, and at any age. Many people look at Guarantied analysis and check protein, fat proportions. But guarantied analysis of dog food does not indicate quality of ingredients. It is possible to have perfect guarantied analysis using leather shoes as protein, lumber as fiber, engine oil as fat, etc. Low quality ingredients affect dog's health. The protein of dry dog food in ordinary kibble is made out of meat remainders and by-products (in other words, "leftovers"). When choosing dog food, it is recommended to look beyond guarantied analysis and look for dog food that uses high quality fresh ingredients. In addition to quality of ingredients, how dry dog food is manufactured plays a big roll too. Ordinary dog food companies that manufacture dry dog food, process their meats at temperatures of 284 degrees Fahrenheit (usually twice), which results in a decline of quality in their protein source. It is then extruded at high pressure, which pops when it comes out and become hard round kibble, as we all know. Dry dog food kibble made in this conventional way has layer of starches around the nutrients. These starches expand in dog's stomach and take a long time to be diluted. This process can sometimes take hours and because dog is a short intestinal track animal, it is not beneficial for its digestive track health. This indigestibility can result in allergic symptoms because digestive systems had to work overtime for a long period of time and digestive systems got weakened. Nature's Kitchen Natural Dog Food wiil be heated at a low temperature, which increases the quality of the final product as well as the digestibility levels of the raw materials (Fresh human grade hormone free Chicken). Vitamins, fats, and a blend of oils (olive, flaxseed, salmon oil, cod and anchiove oil) are added at the room temperature in order to guarantee that they will be absorbed by your dog in their natural state. The manufacturing process of Nature's Kitchen Dog Food is a slow, labor intensive, in comparison to most dry dog foods available out there, but it is healthier and more digestible for dogs. Nature's Kitchen Dog Food will not have any chemical additives, fillers, by-products, or any other products that can compromise the health and well being of our dogs. The Fresh USDA choice chicken meat is as valuable and as nutritious after this delicate cooking process as it was when it was raw. We do not add water during our cooking process so meat is cooked in the natural juices from the fresh chicken, which are soluble proteins and rich in various nutrients, making sure these nutrients are effectively absorbed in the dog's system for body functions. Compare this process to most other dog food manufactures. Many of "fresh meat" used in their manufacturing process are actually "frozen" materials that contain a high amount of ice. Not only will Nature's Kitchen Natural Dog Food be a highly palatable even to very finicky dogs, it is easy on dogs' digestive systems and good for dogs' health! Nature's Kitchen Dog Food only uses fresh ingredients, all USDA GRADE A choice meats, and the revolution in cooking process makes Nature's Kitchen Dog Food ideal for dogs with allergic tendencies and dogs with sensitive stomach. Do you know how a traditional dog food is manufactured? With traditional dry dog food, the proteins usually come from a small fraction of meat meal and mainly from cereals and cereal by-products. Water is then added and the food mash consisting of these components is heated to a high temperature and pressed into croquettes under high pressure. Each individual croquette is coated in a layer of starch that has to be broken down in the dog's stomach first, making dog's digestive system to work hard and long time just to digest. ie; have you seen a dog puking "kibble" long after meal?? Nature's Kitchen Dog Food uses 80 % fresh chicken meat. Ingredients that are easy to digest are added also cold-pressed oils, minerals and vitamins. The ingredients are cooked in their own juices, That’s how Nature's Kitchen Natural Dog Food maintains its high quality. The Cooking Process ensures that Nature's Kitchen Dog Food has all the nutrition your dog needs with rich aroma and taste of meat that your dog will love! If you are worried about bloating, sensitive stomach, muscle building, dull coat, allergies of your dog, Try Nature's Kitchen Dog Food.